There has been a dramatic increase in the number of children living with a peanut allergy in recent decades. 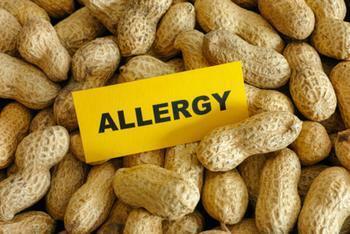 In fact, studies show that the number of kids affected by this major food allergy tripled between 1997 and 2008. Currently, there is no cure for food allergies. However, the results of a recent clinical trial showed that a new wearable skin patch may soon be an effective means of treating peanut allergies in children. The "Viaskin" patch works by delivering a low dose of peanut protein through the skin. Researchers say training the body to tolerate small doses of the allergen in this way (a treatment method known as epicutaneous immunotherapy) was found to be safe and effective, especially in younger children. The one-year trial was conducted by the Consortium of Food Allergy Research (CoFAR) and sponsored by the National Institutes of Health (NIH). In it, researchers asked volunteers (who ranged in age from 4 to 25) with peanut allergies to wear either a high-dose patch, a low-dose patch, or a placebo patch. One year later, the researchers tested the volunteers to see if their peanut tolerance had changed -- and if so, how much. Findings showed that those who had been given the low-dose and high-dose patches experienced similar benefits. The treatment was successful for 46% of the low-dose group and 48% of the high-dose group. The greatest improvement was seen in children between the ages of 4 to 11, the authors note. "The clinical benefit seen in younger children highlights the promise of this innovative approach to treating peanut allergy," said Daniel Rotrosen, M.D., director of NIAID's Division of Allergy, Immunology and Transplantation (DAIT). In addition to being effective, the patch was found to be easy for kids to use. The wearable patch, which could be applied either to a volunteer’s arm or between their shoulder blades, was used correctly by almost all of the study’s participants. "The high adherence to the daily peanut patch regimen suggests that the patch is easy-to-use, convenient and safe," said Marshall Plaut, chief of DAIT's Food Allergy, Atopic Dermatitis and Allergic Mechanisms Section. Plaut adds that the study’s promising results “support further investigation of epicutaneous immunotherapy as a novel approach for peanut allergy treatment." Additional studies will be needed before the Viaskin patch can be made commercially available. The full study is published online in the Journal of Allergy and Clinical Immunology.